So, why do cats like cardboard boxes so much? Watching your cat play around with a box can be incredibly entertaining. After all, cats in boxes make up a hefty portion of many brilliant cat videos on YouTube. But what’s the real reason why your kitty is so into hiding, sleeping, sitting, and playing in boxes? Animal behavior is a growing science that attempts to give answers to why animals do the things that they do. Believe it or not, scientists have actually thought long and hard about cats’ box fetishes, and there are some answers. It doesn’t really matter what size the box is: big, small, awkward, or medium, boxes of all kinds attract literally every feline. Cats may approach a box to leap into it, knock it over, or cuddle up against. So what’s in it for them? 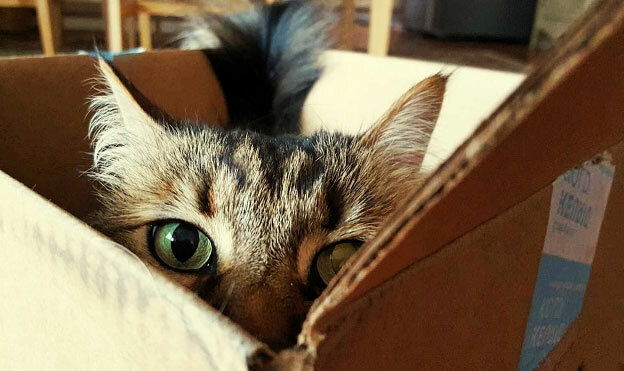 One reason why cats like boxes may have something to do with their natural predator instincts. Barn and feral cats survive due to their strong hunting instinct. But even domestic cats have an instinct towards chasing and hunting, something that comes from their original roots as felines roaming the wild. As a cat owner, you have already noticed these predatory instincts. Perhaps you keep your cat outdoors in order to let it indulge its love of chasing and hunting. Maybe you offer toys that it can bat around, such as catnip-stuffed mice or balls of yarn. Boxes top the list of play time items because boxes give cats a chance to be predators. Think about a cat leaping into a box. This presents the perfect “ambush” scenario: the cat gets to sneak up on the box and then claim dominance by literally plunging its physical body inside. In this sense, boxes are like unassuming rodents, or helpless prey in the wild. Cats like boxes because they provide a tame and satisfying means of exercising natural dominance. This may seem like an obvious reason why cats like boxes, but a box gives your kitty the tantalizing option of an enclosed space. After all, cats sleep upwards of 20 hours a day, so the security of being in a box makes sense. Plus, a cat’s normal body temperature is between 100 and 102 degrees (fahrenheit), so they like that extra warmth. While cats have an ancient history rooted in being wild and surviving on their own in a variety of climates, domestic cats appreciate the security that enclosed spaces offer. But this instinct towards shelter may also have primal roots in your cat’s psychology. Enclosed spaces are warm, or at least enable your cat to warm up quickly. Wild animals of all kinds seek warmth, sustenance, and water. Your cat is no different. Domestic cats also have a propensity to sleep during most hours of the day. They may be active during play time, but they sure do like to cozy up. Boxes present a warm, familiar, and safe opportunity to do so. This explanation takes the above point one step further when discussing why cats like boxes. Your domestic cat may appreciate having boxes around for warmth and security. But your kitty may also have a fondness for sitting or sleeping in an old fashioned cardboard box because it presents an option to relieve stress. Unfortunately, not every cat enters the world happily and safely. Animal shelters exist for a reason, and every day shelters tend to stray, abused, or abandoned kitties. In general, most animals at shelters have a history of neglect, psychological impact, or abandonment. 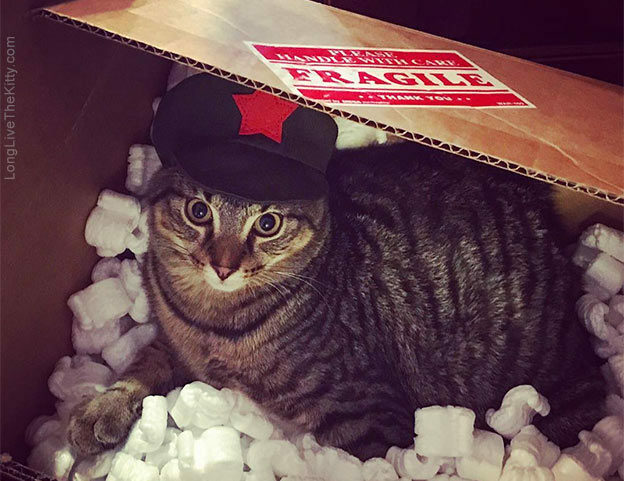 Because boxes offer the impression of a safe, warm, and secure hiding place, stressed-out cats may seek boxes in order to relieve anxieties of being in vulnerable places. Science: Studies actually have been conducted with animal shelter cats in this exact respect. Animal behaviorists are always working with shelters because they give them a great chance to assess animal stress levels and response to the environment. One such study, performed in 2014 by C.M. Vinke and L.M. Godijn, analyzed shelter cats’ reactions to having open boxes near them. They pretty much concluded that shelter cats who had the option of hiding in an open box were less stressed than the cats who did not have the option. This is because the option of hiding is actually a means of coping with a stressful world. This is a behavioral instinct that even humans exhibit. Having the option to hide away for a time from stressful situations can actually lead to better handling of demanding or taxing climates. Strange, how similar cats and humans really are, isn’t it? So, if you want to improve the psychological health and well-being of your feline friend, make sure you leave a few open boxes lying around. Cats like boxes because they present options –boxes are in this sense roadmaps to comfort and a stress-free life. Another reason why cats like boxes is because these cardboard spaces let cats be cats in a very important way: boxes let cats mark a specific territory. Boxes that are always available means that cats can always have the option of independence. When it comes to why cats like boxes, this may be one of the most compelling reasons. It pretty much groups everything that we’ve discussed in this post together: a box is a safe option, a play toy, a chance to ambush and hunt, and a place of warmth and security. A box is also territory, and while cats don’t go around peeing on bushes or trees in order to mark their territory, they also like to lay claim to what is theirs. This is why cats may seem to have really snarky personalities sometimes, because they cultivate particular habits. They like having space to themselves, even if it looks like they’re being anti-social or evading conflict. But this type of nose-in-the-air personality may just come from the fact that your cat likes having its own space, and space that it can feel. Boxes let a cat feel completely dominant, because the box fits your cat’s entire contours. Cats also have an affinity for small, tight spaces –like kitchen sinks, drawers, paper bags, hats, and shoes. They do jump into big boxes, but boxes that are well contained are often more sought after. Cats like boxes because boxes are the ultimate, claimable territory. They feel good because the cat can feel all parts of its body contained, and can know that it’s in control. From a more primal perspective, cats like boxes because they feel safe inside them. 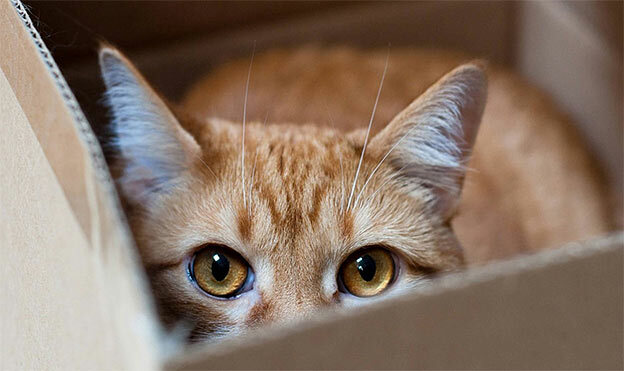 When contained in a box, cats can’t be “snuck up on.” They can survey the playing field and know exactly when to pounce. Lastly, cats like boxes because they may constitute a challenge to your cat. This is especially the case if the box is large, awkward, or strangely shaped. If you have a minute, stroll through a pet store sometime, or browse an online shop specializing in cat toys. You’ll see the usual plethora of catnip, mice, and toys with bells and squeaky things. But you’ll also see cat towers. Cats like to climb, leap, and explore. They scale amazingly high walls and can land on their feet when jumping from nail-bitingly high precipices. A big box is just like a cat tower, but more complex. It has strange flaps sometimes, and the entry point is facing up, rather than to the side. Cats looking at big boxes see an intriguing challenge, and may even visualize one of these larger boxes as a curious competitor to be challenged. Cats like boxes for the challenge even though they can have a propensity for lazy afternoons and complete indifference. But this may not last for long–kitties may still be evolving. Cats are entertaining to watch for a variety of reasons. They like to hunt, stalk, and catch toys or what they consider to be “prey.” They sometimes fall off of walls or couches. 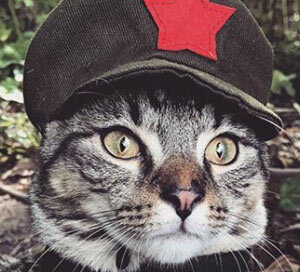 There’s a reason why so many cat videos exist, and why LOLcat is a thing. But sometimes cats just do inexplicable things. People puzzle over why cats like boxes, but the answer really lies in the natural behavior of your cat. An open box is many things to your cat: an opportunity for play and ambush, a battleground that can easily be won, and a challenge. In this sense, boxes exercise your cat’s primal instincts for control and predation. But cats like boxes because they also give them options for security, safety, and warmth. In this sense, boxes are stress-relievers rather than just playthings. Have an experience with cats in boxes, or a great video to share? Post your comments below! 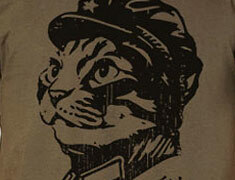 Or check out more offerings about cats and their habits from Chairman Meow. This entry was posted in cat news and tagged boxes, cat behavior, science on December 14, 2017 by zach wills.